Important Note: some websites may offer limited-time promotions or publish statements regarding people who achieved high pass rates or passed the QLTS assessments using their material. You are strongly advised to be cautious when coming across such information and request the details of past candidates who used the material offered on these websites before spending your money. QLTS School does have a proven track record of hundreds of candidates who passed the QLTS assessments as evidenced by about 100 video interviews available on our Success Stories page. QLTS School’s preparation courses for the MCT give you everything you need to complete the assessment successfully on your first attempt. Our MCT courses combine 11 comprehensive textbooks, an online training system with 1,500+ practice questions, 2,500+ flash cards, 15 mock tests, a video library with more than 100 tutorials, revision notes, tutor support and a customised study plan. You can study whenever and wherever you want. No other material is required. We have invaluable insight and extensive experience in preparing lawyers for the MCT. We are currently preparing candidates for the July 2019 assessment, being the 18th round our MCT course runs since the introduction of the QLTS in 2011. The course materials have recently been updated in accordance with the revised SRA’s Day One Outcome A and changes made in the law, and reflect the examiner’s requirements for the 2018-19 MCT assessments. The MCT (Multiple Choice Test) is the first of two assessments you must pass in order to complete the QLTS scheme. The MCT consists of 180 multiple choice questions, divided into two hours and 45 minutes periods of morning and afternoon sessions, each with 90 questions (180 questions in 5 hours and 30 minutes in total). The MCT is a computer-based test delivered worldwide. You must first pass the MCT before attempting the practical assessment, the OSCE. Why Do You Need to Take a Training Course for the MCT Assessment? The MCT is not just another standard examination – there is no specific or pre-determined pass mark. The pass mark is determined by a ‘Standard Setting Panel’ convened by the SRA. Based on the individual questions on the paper, the panel decides what score differentiates somebody who can be considered to have just reached the standard of a newly qualified solicitor in England and Wales from somebody who has not reached this standard. In addition, the syllabus is vast and covers many subject areas of the English law. That means you must meet rigorous and robust criteria in order to pass the MCT, which requires early preparation to develop both your breadth of legal knowledge across the practice areas as well deepen your understanding in each practice area. You don’t want to spend your time on sourcing information and working out what you need to know, as well as ensuring it is up-to-date and accurate. You’ll want to save time by hitting the ground running with the key information immediately accessible and easily digestible so you can focus your efforts on preparing for exactly what the SRA requires. 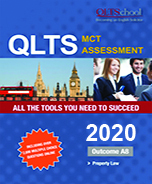 QLTS School’s MCT preparation course is designed to build a strong foundation in the legal concepts essential for success in the MCT assessment. Our course has been designed and developed specifically for the MCT assessment by experienced tutors, who thoroughly understand the SRA requirements and have collectively produced the best preparation course available today for the MCT. We have trained thousands of candidates for the MCT since the introduction of the QLTS in 2011. We know what works and what doesn’t, and will ensure you benefit from our extensive knowledge and experience in helping lawyers like you pass the MCT. You will come to the examination centre with confidence and preparation, no stress and unexpected surprises. The overall pass rates on the MCT have traditionally been low, ranging from 56% to 60%. QLTS School’s candidates, however, achieve excellent results. A comprehensive and independent research conducted a few years ago by ICF International (NASDAQ:ICFI) examined and validated the results of QLTS School’s candidates on the MCT assessments over three consecutive sittings. The research conclusively shows that the pass rate of QLTS School’s course takers was about double the rate or more of non-QLTS School candidates (a cohort of candidates who have self-studied or used support from elsewhere). The findings of the research further show and confirm that about 3 out of 4 candidates who passed the MCT in one of the sittings in scope of the study had prepared with QLTS School, and most of those who passed did it on their first attempt. The conclusion is evident: Taking the QLTS School’s MCT course dramatically improves your prospects of succeeding by a statistically significant amount. Our course will give you a significant competitive advantage over candidates who do not study with us. The multiple choice practice questions, flash cards, video library, mock tests, revision notes and updates for the course materials are accessible through our MCT Online Training System. You will be provided with a unique username and password to login. The textbooks will be delivered to you in days. You can access a demo version of the MCT Online Training System to better understand the scope of the material we offer for the MCT assessment. for the MCT much faster and more convenient, with dozens of video tutorials which guide you from day one of your studies all the way through to test day. The MCT Video Library is based on our proven, straightforward and professionally written textbooks that helped hundreds of lawyers from all around the world to pass the MCT on the first attempt. To pass the MCT, you need to demonstrate that you are able to apply the knowledge of the core areas to the standard of a newly qualified solicitor. You are required by the SRA to apply fundamental legal principles to realistic fact patterns, not esoteric topics or the ability to cite cases or isolated facts, and find a single best answer of five alternatives. If you sat a multiple choice test in the past, you most likely appreciate that practising and attempting as many exam questions as possible is the key to your success. You need to familiarise yourself with the format and type of questions the examiner uses in the actual test, as well as the content and the timed conditions under which the test is administered. 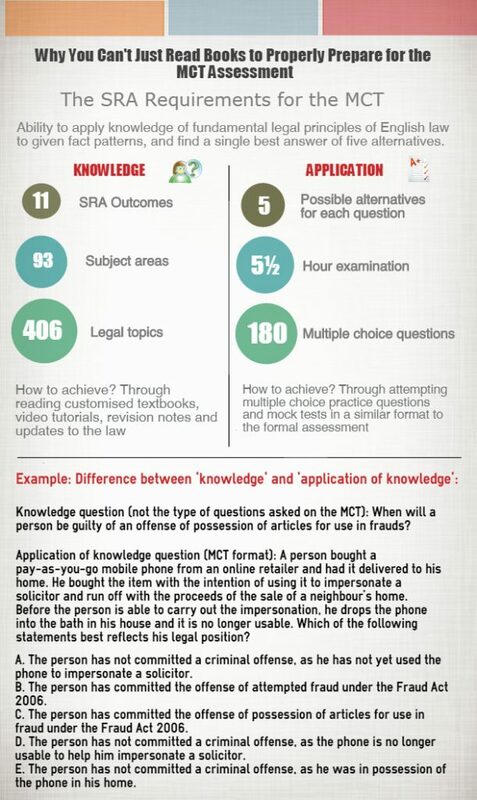 While knowledge can be acquired by reading through the MCT textbooks, our MCT Question Bank and MCT mock tests offer you the opportunity to apply your knowledge by attempting thousands of sample questions, ensuring you are fully-prepared for the formal MCT assessment, and mock tests in a similar format under timed conditions, so that you can develop the exam technique required to identify issues quickly in questions and arrive at the correct answer. Many of our former candidates who have successfully passed the QLTS assessments on their first attempt, mentioned that the Question Bank and MCT mock tests had been the most beneficial and crucial part in their preparation and the best method of study. Our candidates have also mentioned that most of the questions in the formal MCT itself were very similar to the questions they practised in our Question Bank and 15 mock tests! Our database, comprising nearly 3,000 questions in total, is therefore an invaluable and unique resource that will ensure your success in the MCT assessment. We strongly recommend that you watch some of the video interviews we had with nearly 100 of our successful candidates on our Success Stories section and learn more about their experiences in preparing for the QLTS assessments. Take their advice very seriously. Make sure to practise as many MCT questions as possible before you take the actual assessment. Which Course Package Should You Choose? MCT Basic – recommended if you have lower work commitments, need minimal materials to prepare and are therefore able to spend most of your days preparing for the assessment. You will have access to 5 MCT mock tests (with 90 questions each). MCT Advantage – recommended if you work full-time and have limited time in which to prepare. This package includes access to the full suite of the 15 MCT mock tests, which give you the chance to gradually build up your knowledge, skills, speed and confidence at answering questions. You will also have access to the MCT Video Library, which can shorten your preparation time considerably. While the videos are not intended to fully cover each and every aspect of the SRA Outcomes as comprehensively detailed in the textbooks, they are an ideal complement to the textbooks, providing you with another means of absorbing information and developing a good and solid knowledge of the subjects tested in the MCT assessment. MCT Premium – whatever your work commitments are, whether you work full-time, part-time or currently unemployed, this package is for you if you wish to have a dedicated and personalised support throughout your studies. You will be asked to complete a questionnaire, following which one of our MCT senior tutors will conduct an over the phone (Skype or GoToMeeting are also an option) consultation with you and prepare a customised study plan that will suit your needs and personal circumstances. Our tutor will also answer any question you may have during your preparation about the materials through the 2-hour tutor support service. The MCT Premium Course package also includes access to the full 15 MCT mock tests and to the MCT Video Library. You can sign for the MCT course all around the year. 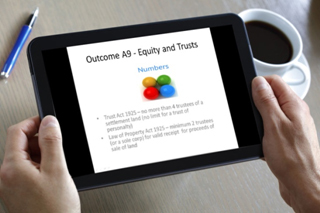 We regularly publish updates for the course materials when the law changes or the SRA update the MCT syllabus, which will become available to download on your online account.